As part of their continuing efforts to create a movement of building community and helping others, the staff at Eagle Creek wrapped another successful Service Day on October 12, 2017. Partnering with California State Parks and working with rangers at South Ponto Beach and from California State Parks, the staff at Eagle Creek HQ were able to contribute in a meaningful way to preserve and protect their local South Ponto Beach, a place they have often hosted company-wide horseshoe tournaments and family beach days. 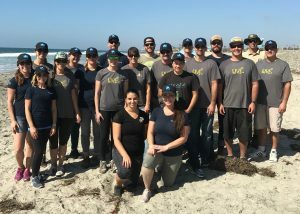 The Eagle Creek team helped out by digging holes and setting posts at South Ponto Beach, which they then roped off to protect the dunes and natural habitat. This proved to be a little tricky due to heavy sand and the abundance of beach rocks, but Creekers are problem solvers and so rose to the challenge and persevered, despite the hole-collapsing task. Other Creekers relentlessly weeded non-native and invasive iceplant from the dune areas. 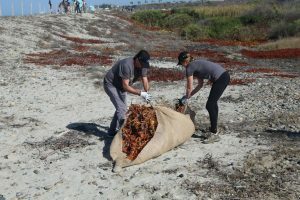 Also, once removing iceplant, birds return to the area to nest.